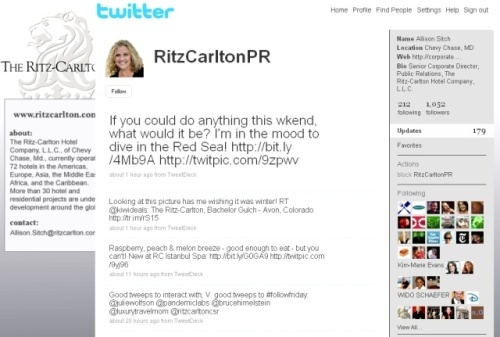 With a start-up date of April 29, 2009 and only 1062 followers, it appears that the Ritz Carlton is a 'newbie' to the Twitter scene. However, based on the quality of its 179 updates, it does look like its making up for lost time. 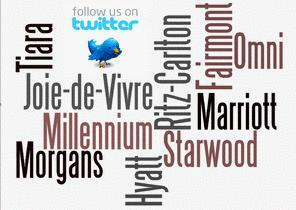 As one of Marriott's most prestigious brands, this group of hotels have titled their Twitter profile: 'RitzCarltonPR.' While 'public relations' is not the most endearing of terms for an account on Twitter, the brand does offset this corporate label with the involvement of Allison Sitch, senior corporate director of public relations. She lends a personal and hospitable touch as the account's spokesperson. Allison's email address is also listed on the account which lends credibility that this hotel brand is sincere about their desire to engage their audience. Based on Twitter's restriction of a 140 characters and the the principal of "a picture is worth a thousand words" the Ritz Carlton does an impressive job of linking to enticing Twitpics of their properties and destinations around the world. 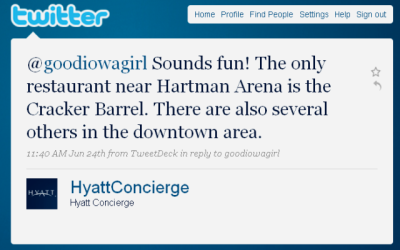 While Hyatt doesn't list the individual names of the Hyatt members on staff that man their Twitter account, the profile name "Hyatt Concierge" indicates they are taking a 'service' approach to microblogging. What's most impressive is the number of updates that they address to specific followers using the @reply greeting and then following up a ongoing dialogue by requesting the guest DM them back. Their present stats show they are following 3537 and have 3434 followers. The account is not a promotional vehicle, stresses Farley Kern, Hyatt's director of brand public relations. "We wanted to have a presence on Twitter that was about our guests and for our guests and designed around our guests, as opposed to having a presence on Twitter just for the sake of being on Twitter," Kern says. 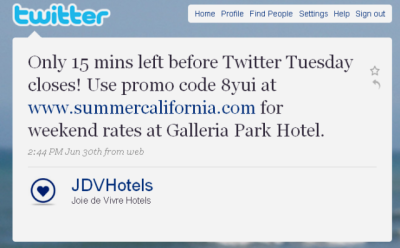 "JDVHotels' as they call themselves on Twitter maintains a suberb interaction with the Twitterverse. By utilizing TweetDeck (an Adobe Air application for Twitter), Joie de Vivre is using one of the most updated and personalized tools available for managing an account on Twitter. For those that are unfamiliar, here is a short overview of the advantages of managing an account with Tweetdeck. Tweetdeck also allows Joie de Vivre to not only see what folks are saying about their brand or a specific hotel property, but to also interact with these individuals to move the conversation to the next level. Their numbers are impressive. As a much smaller hotel chain than some of the big boys on this TOP TEN, they has attracted over 3200 followers while following 3400+ themselves. 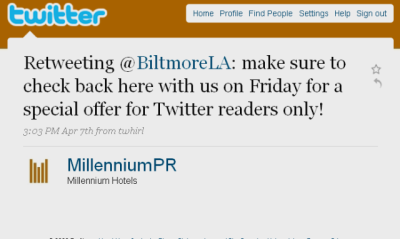 Their special "Twitter" deals are sometimes time-sensitive to appeal to hotel bargain hunters, as evidenced in this Suite Tweet. 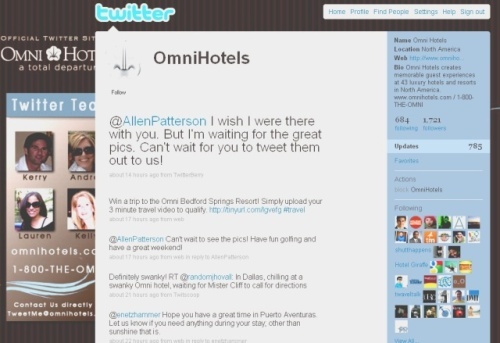 Omni, not only has a presence on Twitter, but also promotes the service from its Web site. 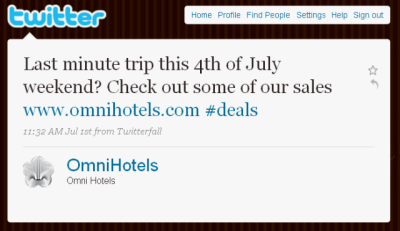 Leading up to the recent July 4th holiday, they announced the following offering: "Omni Hotels will promote a new package each day via Twitter leading up to the Fourth of July holiday. For additional information, follow Omni Hotels on Twitter at twitter.com/omnihotels or visit atweetdeparture.com"
While they don't include the staff members in their profile info, they recently added the photos of 4 employees who are members of their Twitter Team, allowing followers to associate the name with the face (similar to the approach taken by Ritz Carlton and Allison Sitch -see above). An email address is also listed for offline communication. 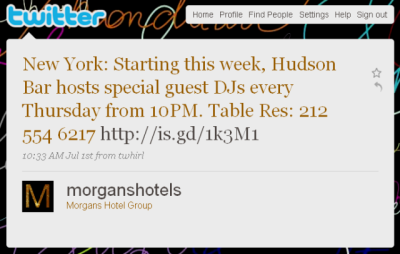 Their profile reads: " Timely tweets, news, comments and updates from the world's leading hotel company. Check-in and check-out with Kevin and Ben' (the two staff members that run the day-to-day operations of the Twitter account). 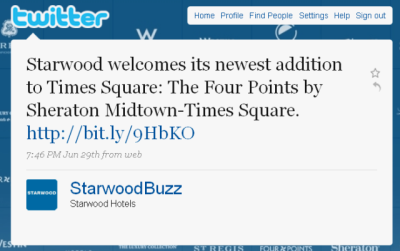 All of Starwood's brands logos are represented on their Twitter page and to date they have accumulated 3800+ followers. However, for such a large brand, they could 'up the ante' a little on updates. To date, the brand has only issued 121 tweets. Morgan Hotels, like other hotel brands on this list do a good job of cross-pollinating from other social networks like Facebook. They have a good readership base of more than 2,624 followers. However where they fall short is they are currently only following 31 people. On the other hand, where they get high marks is their ability to engage with their customers in a slightly off-beat and casual manner. They also include links pertaining to the music that is featured in some of their hotels, performed by DJs at hotels like The Sanderson in London. Their Twitter homepage is similar to the look and feel of their Web site and is indeed a funky representation of the brand. Morgan's controversial promo campaign titled has created a lot of viral buzz and helps position the hotel chain as a respite for the trendsetting, hipster crowd. And while not actively promoting the campaign on their Twitter site, I am sure the followers that are attracted to edgy promotion who learn about this campaign elsewhere will be very much inclined to communicate with this brand on Twitter versus some of the other TOP TEN brands listed here. Fairmont may have the trademark for "Suite Tweets" since their profile reads: "'Suite Tweets' courtesy of Fairmont Hotels & Resort, a collection of distinctive hotels." With Mike Taylor at the helm, it appears that Fairmont has done a commendable job in targeting the travel media from their Twitter perch. 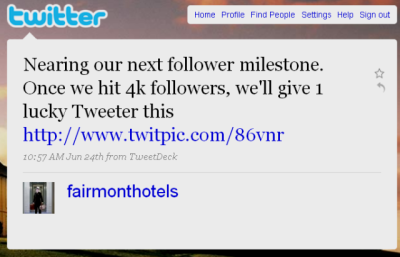 The PR team at Fairmont Hotels & Resorts has created a presence on Twitter with an emphasis on the travel & news media. 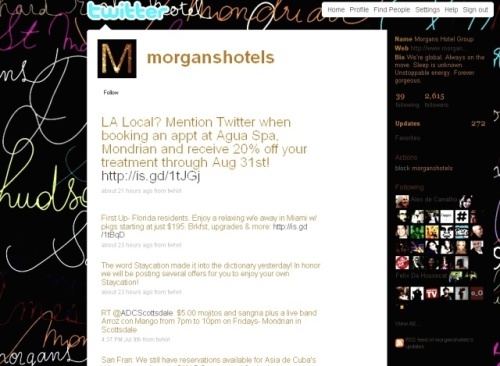 The brand’s Twitter page was established with writers in mind and provides journalists with daily updates on the brand and their unique collection of luxury hotels. Updates range from products announcements and renovation updates to press trip itineraries, and with 4178 followers they appear to be attracting a good number of believers in the brand. Taylor calls this "perception management," and it's becoming more and more important. "It's more just so that we can keep in touch with people," he says. "It's about brand awareness." He also adds "every hotel and brand should consider Twitter. Even if time proves it to be a passing fad, so what? It costs nothing, it's easy to learn and extremely quick to use." 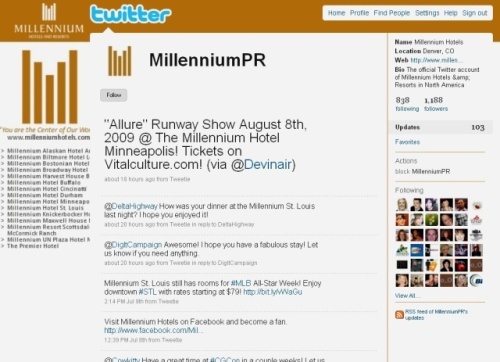 Millennium Hotels (similar to the Ritz Carlton) named their account 'MillenniumPR.' In so doing, the hotel chain makes it clear that they place an heavy emphasis on their public relations ability to tell the brand's story on Twitter. Since joining Twitter on November 11, 2008, their tweet updates of 108 are somewhat limited, but their engagement with their customers appears to be very welcoming and genuine. Even with their PR emphasis, this brand's messaging is not self-promoting and often provides tips and links to industry trends that are helpful for the traveling public. Of particular note were several recent tweets that provided links to authoritative sites such as MSNBC and New York Times on topics that related to how to leverage social media when traveling. 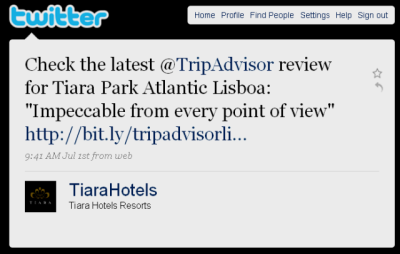 Tiara, a Portuguese hotel group is very active on Twitter with almost 1030 updates, more than 2152 followers and an outstanding 1641 Twitter accounts they follow. And they do an excellent of acknowledging their fans on #FollowFriday, the traditional Twitter courtesy of "tipping one's hat" every Friday to followers as a 'thank you' and encouragement for others to follow based on one's recommendation. Nuno Valinhas of Tiara Hotels asserts that Tiara's strategy in the social media environment is "to get outside...to be visible... and to try to reach more and more potential clients. Beside our offline Marketing campaigns and actions, the social media networks enable us (with a cost of ZERO) to somehow influence and engage more people to get to know our brand/name as well as our hotel, and their locations." I chose not to name the Four Seasons Hotel firm as one of my TOP TEN. 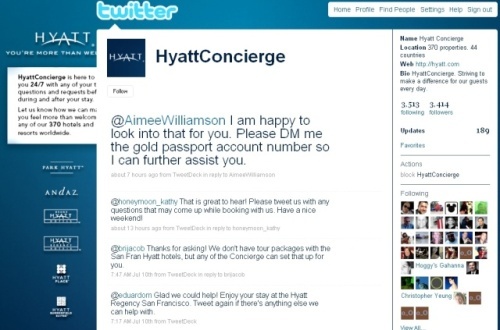 While an excellent 4-5 star hotel brand, their activity on Twitter does not present them in the best of light. In my humble opinion, they have opted for a "push" strategy in how they utilize Twitter. What that means is they're more interested in pushing information out to its 2,049 followers. This is evidenced by the fact they are only following 5 Twitter accounts. It is also my opinion that the hotel brands listed here and the hundreds of others not mentioned are all in the midst of a long-term learning curve. No one brand has all the answers. Nor is there one brand the others emulate at this point in time. They have all realized the value of the Twitterverse and how it can reinforce brand loyalty and attend to customer service issues in a timely fashion. They now need to assess what is and is not working as it relates to their clientele and potential guests on a more personal level. The hotel industry, long known for its hospitality-focus needs to take what they know best in the hotel environment and apply those best practices to attending to guests online. 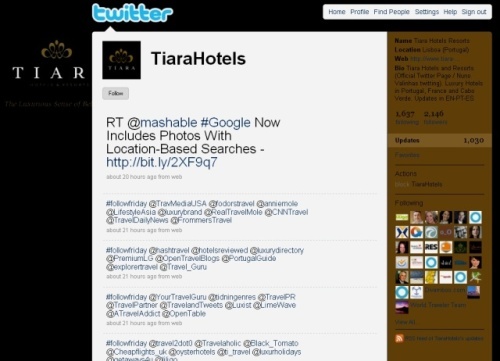 If you are trying to find other hotel brands on Twitter, here is great resource that includes links directly to their profile pages ---> HOTELS ON TWITTER. 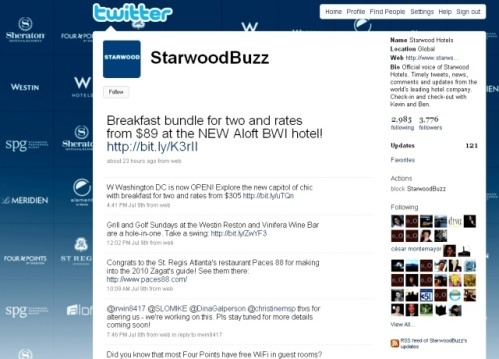 Which Hotel Brand does the best job on Twitter? How To Turn Your iPod into a Game Boy–On the Outside! Have you followed Affinia Hotels? 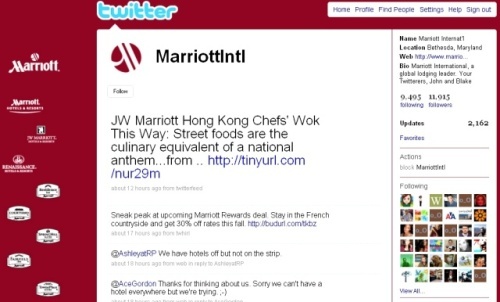 @marriottintl appreciates the shout out. We also have two other feeds @renhotels for Renaissance Hotels & Resorts and @marriottgreen for environmental initiatives...more coming soon. 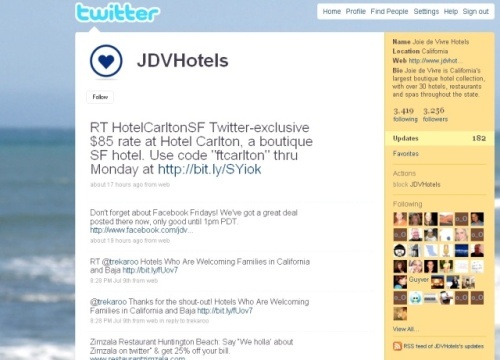 Kudos to our friends @RSHotel for embracing Twitter and social media. They do it right. Appreciate the kind words Ron! Thanks for including @fairmonthotels on the list. ...for the kind recognition, Ron! What I'm noticing as being "missing" in the mix from both Hospitality and the Transportation industry is pro-active activity based promotions. Often when I attend a podcamp / barcam / etc., it's often not located at a traditional expo center surrounded by hotels and linked with many transportation options. Now these events are very easy to track down on twitter all neatly compartmentalized with hash tags. It would be great to see a few hotels chime in and announce their proximity to these events, if transpiration is readily available and if the venue is perhaps in walking distance. I rely heavily on Google Maps for this info but it just can't replace the knowledge of a "local" for realistic answers to these questions. Since you all seem to be interested in hotels and the latest in online social media, you should check out Memohotel.com. You know how when you're looking for hotels to stay at, it's always tricky trying to find a good way to keep track of all your research - prices, location, why you liked the hotel, etc.? With memohotel, you click a button on a hotel's website and the hotel is automatically added to a list of hotels in a trip you create. You get photos, a map, prices, contact info and a place to leave your notes about the hotel in one easy to use list. Plus, you can send the hotels messages right from your list, so all your correspondence is in one place. No need to go searching through emails. Also.... I would say the best hotels that are twittering aren't chains... they are the independents that really need to create a unique persona for their offerings.... like @allisoninnspa. My two cents @hhotelconsult. Cheers. Ron, i enjoyed reading your article and top 10 list, keep up the good work! 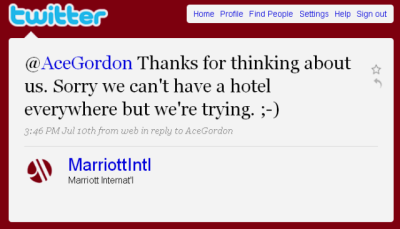 We will link this on our www.twitter.com/athens_marriott as well. Hope to see you soon in your Athens Hotel; The Athens Ledra Marriott . That is really something. Congratulations! I also posted first Polish hotel to your list, I hope you will manage to include it soon. 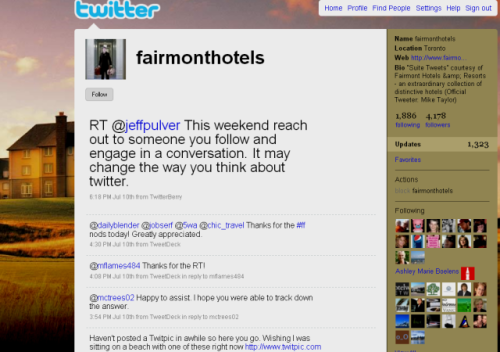 Agreed that these hotels do a nice job using Twitter. As crappy as many of their hotels have become, Ritz-Carlton does do a very nice job. I think accolades should also go to Omni and Hyatt! Attitude is definitely everything, FTR should be copied and used as much as possible... really shows how social media innovation can be used. great job.